Get ready for a round of applause and a standing ovation from your dinner table guests with this impressive dish! The dramatic presentation of the Crown Roast of Lamb will make a memorable centerpiece dish for your holiday dinner celebrations. The best part is your friends and family will think you spent all day preparing when it actually was no trouble at all! First thing’s first, what is a Crown Roast of Lamb? 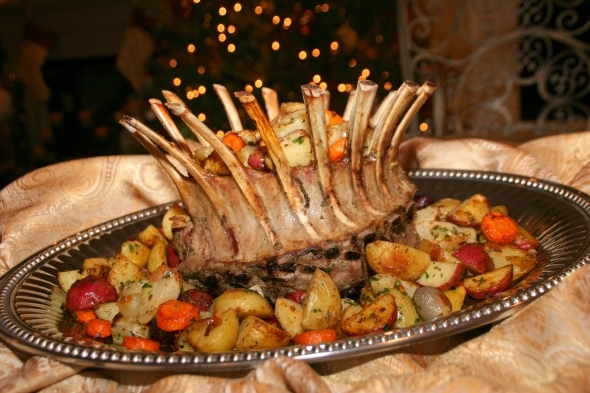 Simply put, it’s two lamb racks formed and tied together to create a crown. You could attempt to assemble the crown yourself; here is a link to a recipe that explains the process by the well known Alton Brown. Although it’s really not worth the trouble because the butcher at your local market can have it ready for you in no time. In fact, if you want a great tasting lamb, probably the best in town, look for your nearest Harvest Ranch/Jonathan’s Market in San Diego. The lamb they have available is exceptional. To make the preparation easy, I created a marinade that’s used for both the Lamb and Roasted Potatoes. The marinade is quite pungent as it is necessary to sink flavor into the lamb. The result will be just enough to compliment a mouthwatering cut of meat and a delicious, earthy combination of root vegetables. You can go the extra mile and make a dipping sauce for the lamb using the pan drippings. I experimented with a white wine reduction, but decided that the lamb stood best on its own. I would love to hear what you come up with for this fantastic dish. 1. Marinate the lamb for a minimum of 4 hours or up to one day. The layer of fat around the lamb does not allow the flavors to sink in quickly. 2. DO NOT OVERCOOK. Rack of lamb should never be cooked more than medium to enjoy the best flavor. 3. Use a cast iron pot (Dutch oven) or roasting pan if possible. Cast iron material does a great job of evenly distributing heat. 4. Savor every bite, be merry and enjoy the holiday season! You will feel like a 5 star chef after preparing this extraordinary lamb dish! Marinate Lamb: Pour ½ cup of marinade in a round dish deep and large enough to hold the lamb. Place lamb in the dish (the meat of the lamb is mostly at the bottom) ensuring that the bottom of the lamb is sunken into the marinade, rubbing the rest of the lamb with the marinade ensuring to rub all over including the outer edges and center. Place dish in a clear bag large enough to fit the lamb, remove any air and seal bag. Refrigerate for a minimum of 4 hours or up to one day. Roast Lamb: Remove lamb from bag, (DO NOT DISGARD MARINADE) and sprinkle generously with coarse salt and fresh ground pepper, be sure to season the bottom. Place lamb in a heavy roasting pan (cast iron recommended) along with any of the reserved lamb marinade and bring to room temperature, about 45 min to 1 hour. Meanwhile, preheat oven to 450 degrees with the rack in the bottom third (lamb should roast in the middle) and cover each lamb bone loosely with foil. Roast in the oven until a thermometer inserted into the thickest part of the lamb away from the bone reaches 125 degrees for medium-rare (about 30-35 minutes) or 130 degrees for medium (about 35-40 minutes). Remove from oven, transfer lamb to center of a large platter, remove foil from bones and cover the lamb loosely with foil for 10 minutes. Prepare Roasted Potatoes and Root Vegetables:(This can prepared at the same time in a separate oven or right before, kept warm and covered with foil) Place rack in the middle position and set to 450 degrees. Place pearl onions, potatoes, turnips, parsnips and carrots on 1 to 2 baking pans depending on the size (do not overcrowd the pan) Sprinkle with salt and pepper and toss with ½ cup reserved marinade to coat vegetables completely. Add additional evoo if needed. Place in the oven and roast until tender, about 30- 40 minutes, tossing occasionally. Remove from oven and gently toss with chopped parsley. Assemble Dish: Spoon roasted potatoes and root vegetables all around the platter and in the center of the lamb and serve.